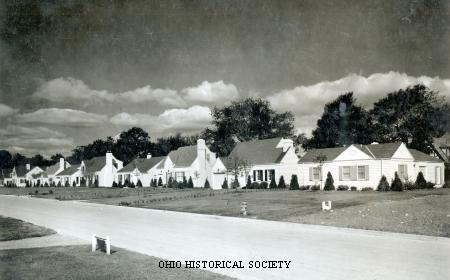 Photograph of a residential street in a suburb of Akron, Ohio, ca. 1935-1940. Suburbs are neighborhoods near to but not located in the center of cities. As early as the 1880s, many Americans who lived in cities sought to escape the congestion, the noise, and the pollution of the large urban centers. The wide-scale availability of the automobile in the 1920s permitted many people, especially middle-class and upper-class ones, to move outside of the cities and to commute to work. This movement out of the cities led to the development of suburbs. This process increased following World War II. Thanks to the G.I. Bill, many Americans of all races, for the first time, had the ability to attend college and to earn better salaries. Americans, especially white ones, prospered during World War II, as both men and women found employment to aid the United States' war effort. With the war's conclusion, many workers, especially women, found their positions terminated, but families had accumulated enough wealth to leave the inner cities to move to suburbs. Improvements in transportation, the development of interstates during the 1950s, and the increasing accessibility of cars, all spurred this movement from the cities to outlying neighborhoods. Americans wanted their own homes with green grass. They were increasingly unsatisfied with apartment living, paying their wages to live in someone else's building. Suburb communities quickly developed in Ohio during the twentieth century. Among Ohio cities, Cleveland and Cincinnati first experienced this migration, which especially occurred following World War II. Suburbs grew so quickly in the Cleveland area that this city has a relatively small residential population, with most people commuting into the city from suburbs like Shaker Heights and Parma. By the 1960s, Columbus also saw a similar retreat to the suburbs. Westerville, Gahanna, Dublin, New Albany, and Worthington are just a few of the suburbs surrounding Ohio's capital city. Once small and distant communities from Columbus, they are now in easy commuting distance of the larger and city, and in the case of some communities, like Worthington, the capital city has surrounded this smaller suburb. As Americans moved from the cities to suburbs, business owners began to develop new retail establishments to attract suburbanites. These establishments were known as shopping centers. Numerous businesses opened their doors in a single location, usually in the exact same building or several interconnected buildings. These shopping centers usually had a wide variety of stores, including ones that sold groceries, clothing, greeting cards, and numerous other items. Banks and restaurants also commonly existed in these shopping centers. The shopping centers provided their customers with a single location to do all of their shopping, greatly enhancing the shoppers' convenience. These shopping centers quickly drew customers away from more traditional stores, as customers wanted to travel to only a single location to do all of their shopping. The Town and Country Shopping Center, which opened in 1956 in Columbus, might have been the first one in the nation, although several other centers across the country claim to have been opened more than twenty years earlier. As the twentieth century progressed, suburbs also developed additional attractions to lure people from the inner cities. Museums and art galleries became commonplace. Stadiums and arenas also found their way to the suburbs. An example of this is the Germain Amphitheater located in Polaris, on the outskirts of Columbus. While many urban Americans sought homes in the suburbs, the development of the outlying neighborhoods did result in several problems. First, not all Americans experienced equal access to the suburbs. Racial discrimination commonly occurred, with many communities effectively denying African Americans, Latino Americans, and other ethnic minorities access to these newer neighborhoods. Second, as people, especially white ones, and then businesses moved to the suburbs, inner cities commonly became stagnant, with little opportunity. Poverty rates grew dramatically in the inner cities, providing these residents with little hope. Commuting also resulted in increased use of gasoline, pollution, and more automobile accidents.